It was a frustrating night for Arsene Wenger and his boys. His last chance of winning a European cup was dashed by Diego Costa even with Diego Simeone not present on the touchline. When Wenger announced last month he will be leaving Arsenal at the end of the season, the players were disappointed and some of them promised to win the Europa League for the manager. As we know, Wenger haven't won a European competition in all his 22 years as Arsenal Manager. In a night where Arsenal only need a goal or two to book their place in the final, Diego Costa! 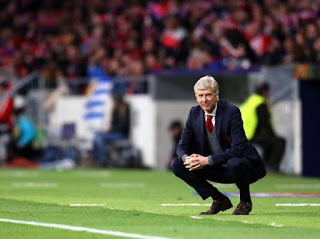 a man who has always been an headache for both Wenger and his boys step up to hurt them and dash Wenger hope of winning . 'Tonight, one minute before half-time we conceded on the counter-attack and you know it's a critical stage of the game. Psychologically you know these are crucial moments. It really so sad to see Arsene Wenger ending his time with Arsenal without a European trophy but we wish him all the best in his next Managerial career.